My son’s son is turning 18 this month and he lives 3,000 miles away in Pennsylvania. My daughter’s daughter will be celebrating her first birthday next month—farther away in Fiji. So this grandmother is feeling rather emotional and overflowing with love at the moment. This letter is for all my grandchildren, my future great grandchildren, and for the children you love, and for all the children of the world. 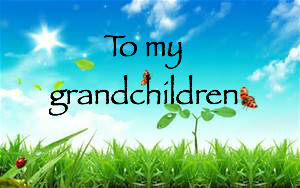 Prompted by my dear friend, Fran, I originally wrote this “Letter to my grandchildren and great grandchildren” in 2009. I placed the hand-written version in my notebook that contains my Last Will and Testament, along with my notes and wishes for when they will be needed. But this week, after seeing all the pictures on Facebook of the sweet faces of all the children heading off to school, I was compelled to send this yesterday to my grandchildren. I mean really, why wait till I’m dead? And then I thought I’d share it here with you. Please enjoy and share this letter. Feel free to adapt and change words and send this to a child you love. First of all, I want you to know that you are a precious being, inside and out. You are infinitely loved—loved and treasured beyond words. You have been loved long before you were born to your incredible parents. You picked them, and they picked you! You have special things to teach each other. You are so deserving of all good. You are enough. Never, ever doubt that, no matter what the world around you might say. Whenever you encounter a tough choice or decision, get quiet and ask God or Spirit or whatever you call the Divine, to light up the way to the answer. You will probably find the answer delivered to your heart, not your head. When you grow into adulthood, don’t feel compelled to fall into the stress of “earning” a living. Create your days doing what you love. You don’t need to earn or strive, but be who you are and use your gifts and talents to share with the world. Be of service. Be a force for love. Offering your gifts to the world can unfold in many ways. Let generosity flow. And notice how important is to both give AND receive graciously. Oh yes, when you choose your life’s path, it gets to be your path, not your parents. Be all that you are and don’t copy anyone else. You are an original! Love deeply and love passionately. Be sure to not give up any part of yourself to please others. Take care of yourself first, not in a selfish way, but in a self-FULL way. Never let anyone silence you. Your respectful and honest voice deserves to be spoken. Practice forgiveness. (Oh, it does take practice!) When you forgive someone, it doesn’t make their actions right but you will find yourself released from the pain. And sometimes it’s important to feel the anger first, (righteous anger, I’ve heard it called) before you can get to the forgiving part. Don’t worry about the future but make healthy decisions today so your future will be grand and the planet will be better than it ever was when you arrived. Leave it better for your children and grandchildren. Know that peace begins in your heart. And know that having peace in your heart is where world peace can blossom. When things are overwhelming and challenging and you are not sure what to do, offer all of it over to the Divine. You can do this in your head, or you can write it down, or you can throw your hands up and say, “Here! This is Yours!” Then listen for the next best step to take—and take it. Be grateful. Every night before you go to sleep, think of at least ten things to be grateful for so you are smiling as you drift off to dreamland. And know, that as you read or re-read this at any age in your life, I am either loving you from this earth or from beyond. Originally written by your grandmother, Susan Tate, in 2009. Expanded for you on September 3, 2015. Susan Tate Community Facebook page. This entry was posted in 2015, Aging Gracefully, Divine, Forgiveness, Gratitude, Love, peace, prayer and tagged children, Love, peace, prayer, self-care on September 3, 2015 by Susan Tate. Thank you! And it’s great hearing that you will write to your little grandniece. I will practice all this before I pass it on to my grandson! And know I will be practicing this too! Thanks for your comment . . .and your grandson is very lucky.